The most striking thing about the show was that it attracted more attention online than any other event that the club has attended. 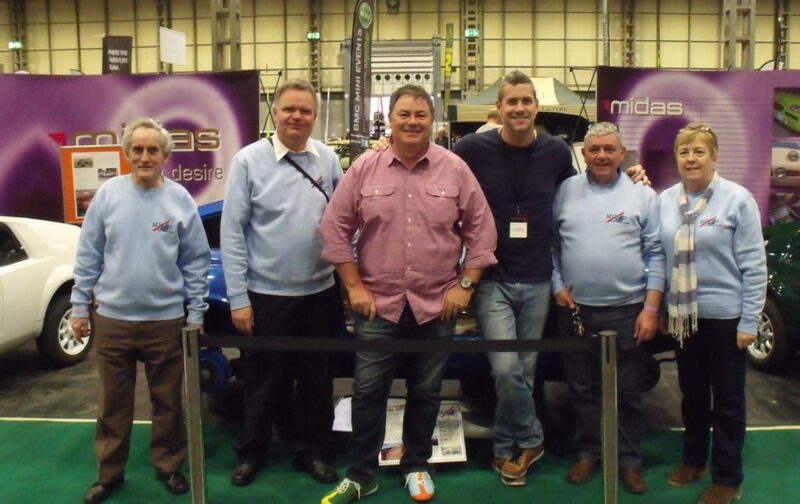 Partly this was thanks to Mike Brewer posting his ‘I’ve got the #Midas touch’ photo on his Twitter account – https://twitter.com/mikebrewer/status/977231086563549185 – but also thanks to the many Midas enthusiasts who posted up their own photos of our stand and helped to spread the word. 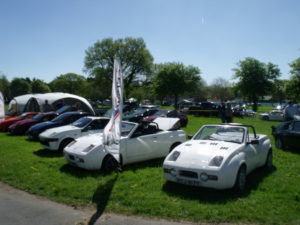 After we had recovered from our efforts in March it was off to Stoneleigh at the start of May for the National Kit Car Show. Once again there was a large club turnout with some 17 cars present on Sunday for the concours and AGM. The brilliant sunshine of Stoneleigh was only matched by our visit to Gaydon at the end of May for the National Metro and Mini Show. We have always received a warm welcome at Gaydon and enjoyed the opportunity to look around the museum collections and this year we had the added bonus of being invited into the arena to show off our cars. 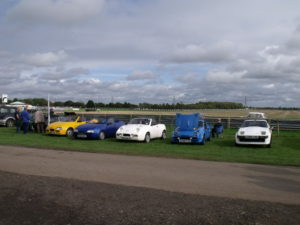 With a Mk2 Bronze (Brian Badcock), a Mk3 Gold (Richard Streets), a Mk4 Cortez (Tony Moss) and a Mk4 Excelsior (Alistair Courtney) lined up the marque was well represented. June saw us back down in Somerset at the Royal Bath and West Showground, Shepton Mallet, for the Bristol Classic Car Show. The weather was good, but fortunately not as hot as 2017 (when ice creams had to be devoured immediately, before they meleted). 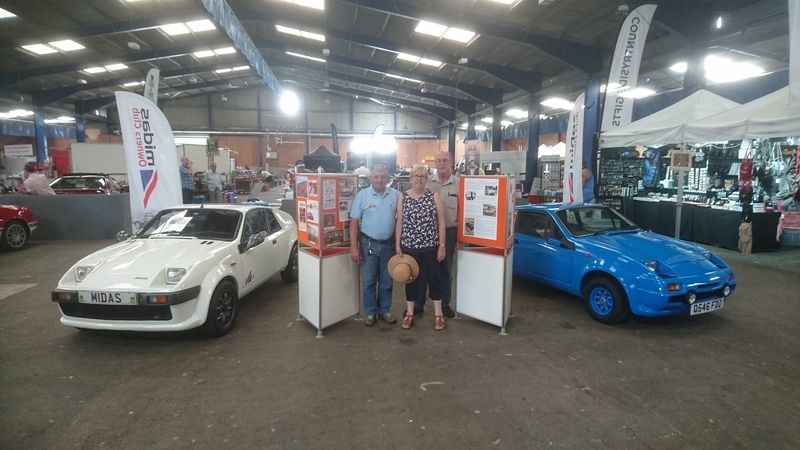 The club had decided not to attend the November show in Shepton Mallet, due to its proximity to the NEC show, instead we concentrated our efforts on the summer event and managed a line up of five cars. This is always a friendly and popular show and we plan to return in 2019. 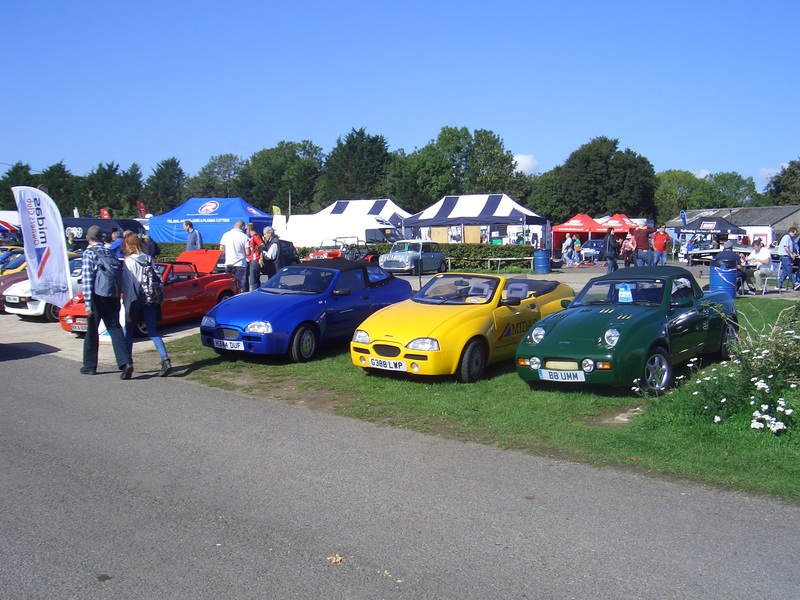 July is a quiet month for large shows, so the club gathers at the Alternative Cars open day. This year the attendance of Midas Cars was slightly down with at least three regular visitors attending in non Midas cars due to various issues. This did not dampen the enthusiasm and camaraderie. Once again we all tucked in to a barbecue and enjoyed the opportunity to discuss all things Midas. 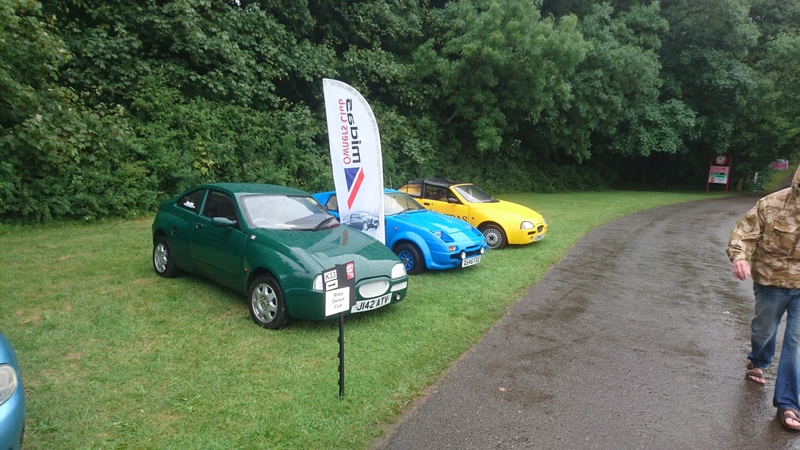 This year the Stanford Mini Fair was cancelled due to bad weather (yes there was one day of bad weather in 2018) so our next event was at Castle Combe for the Mini Action Day. This year we had a spot in the extended paddock, but again we were down on cars due to various issues. 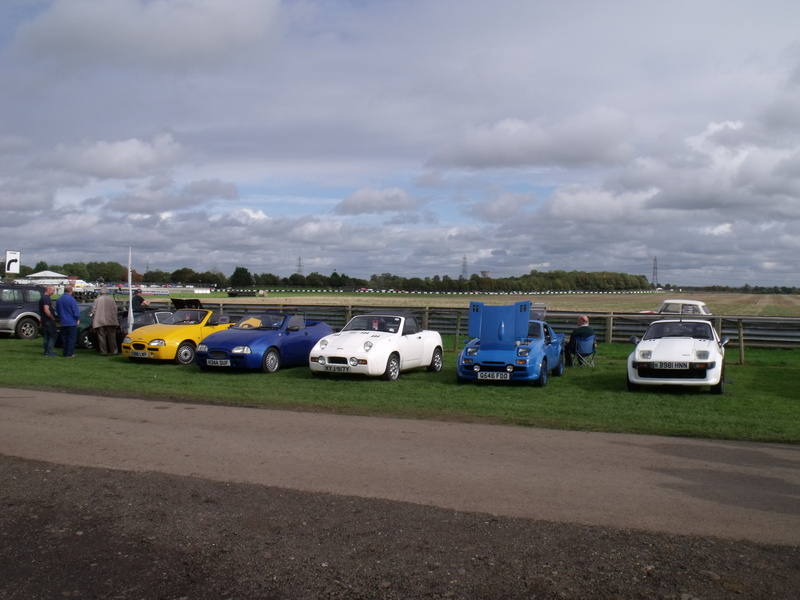 With just 4 Midas cars present we were outnumbered by our friends in the Mini-Marcos club for the first time in many years. The member to cars ratio was 2:1 so the opportunity to double our presence in 2019 exists. 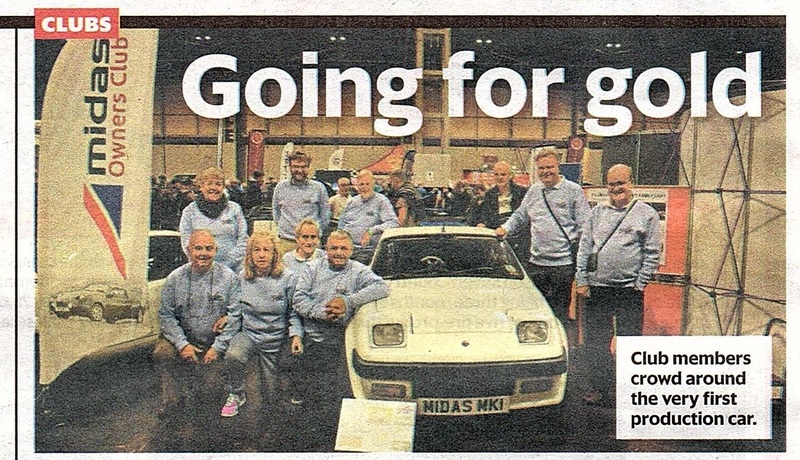 We finished off 2018 with a return to the NEC for the Classic Motor Show and with the event falling more, or less, 40 years after the Midas marque was launched the club pulled out all the stops to make sure that our stand was well presented. Not only had we tracked down and borrowed the very first Midas, the original prototype that debuted at the Performance Car Show at the end of 1978, but we had also arranged to borrow Gordon Murray’s Midas-Alfa, possibly the best known (if elusive) Midas of all. MOC stand just before the show opened. Flanked by Neil Franklin’s Excelsior and Richard Street’s Gold Convertible these two notable cars provided much interest throughout the show. That brought 2018 to an end, but with several notable Midas anniversaries to celebrate next year, 2019 looks to be even busier. 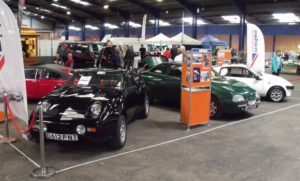 May 2016 – The show season started with the big one: The National Kit Car Show at Stoneleigh. This has already been reported below, but is worth mentioning again in preparation for Stoneleigh 2017 on Sunday April 30th and Monday May 1st. The club will be taking a large plot again and plan to attend with a marquee and barbeque for our AGM. 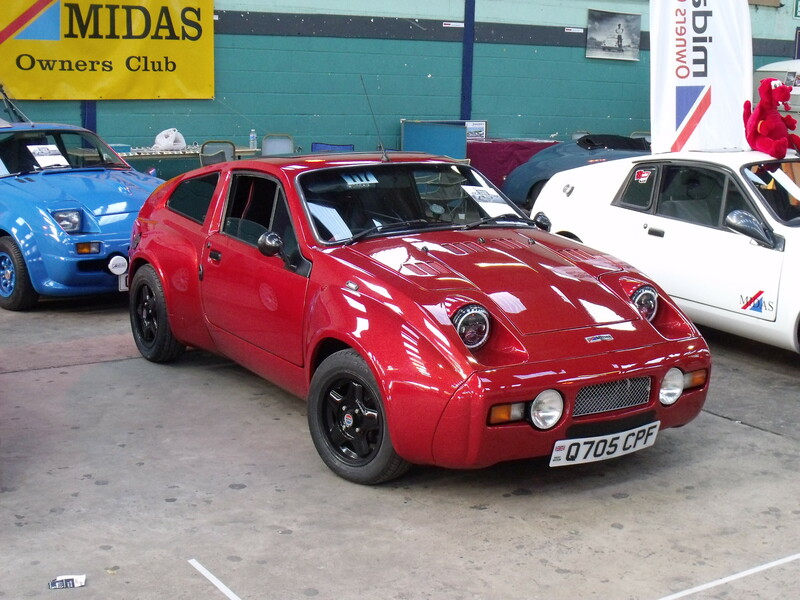 At the end of May we also squeezed in two events at the British Motor Museum at Gaydon. The Gaydon Festival of Transport was just one week before the National Metro and Mini Show, so a couple of Midas owners found themselves visiting Gaydon twice. However, free entry to the museum and the heritage collection, as well as the vehicles of the show itself, meant that there was plenty of interest to see on both occasions. 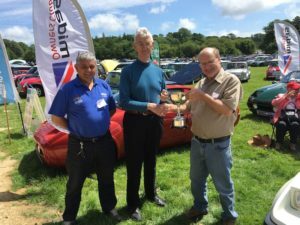 June 2016 – The club attended the Bristol Classic Car Show – see below- and the following weekend we also had a small plot at Castle Combe for the Classic, Kit and Retro action day. This show continues to grow and this year the trade contingent was more focused on track action, so more cars were out on track. The weather was excellent until just before 4.00pm when dark clouds started to gather to the West. We all headed back to our cars and those of us in convertibles just had enough time to erect the roofs before the heavens opened up. July 2016 – The Alternative Cars Open Day and MOC Barbeque is now a strong feature on the club calendar. 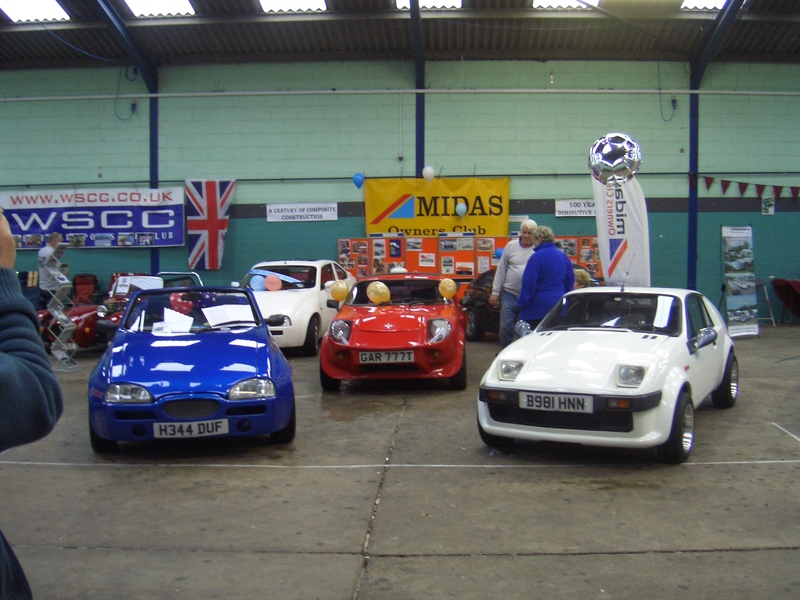 It is the only event each year solely dedicated to Midas Cars and the best chance to talk shop. 2016 saw a turn out of around a dozen cars and several more owners in attendance who hope to bring their cars in future. Our run of excellent weather was finally broken, but only in the afternoon after we had already finished off the barbeque and held an informal club meeting. September 2016 – August is always a quiet month, but September more than makes up for it. For owners in the South West the month starts with the Haynes Rare Breeds Show. This year a new format meant that a club patch could not be guaranteed. Consequently, the three Midas owners who did attend found that their cars were parked far apart. Hopefully things will improve for next year. The following weekend was the National Mini Day at Stanford Hall, where the club was represented by five cars. 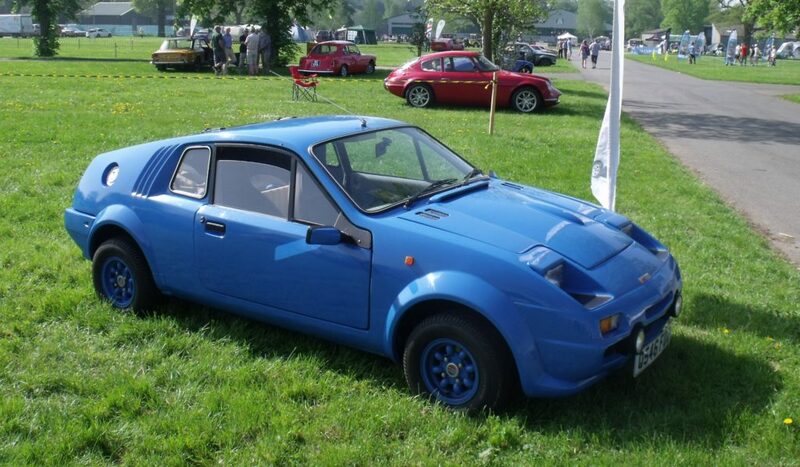 This included two Midas Bronze Decathlons, some of the last cars to come out of the Corby factory. Of the ten Decathlons sold, four belong to current club members. So hopefully we can get them all together in the near future. Then the very next Saturday we were out in our cars again for the Mini Action Day at Castle Combe. Another MOC favourite. 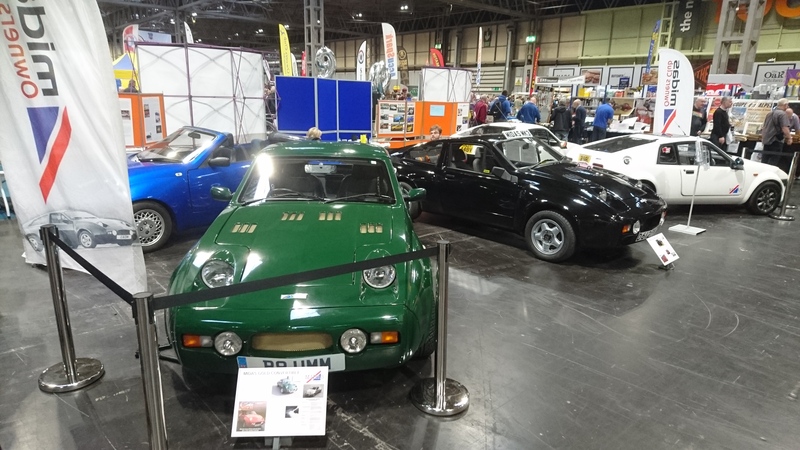 A late change of date meant that the event had lost its “last Saturday in September” slot and this evidently was not met with enthusiasm as attendance was down generally and the trade stand contingent (one of the best features of the show) was particularly affected. The members of the Midas Owners didn’t let that dampen their enthusiasm and at one point we managed to cram nine cars onto our stand. However, with several owners partaking in lapping sessions and a large contingent joining the lunchtime parade lap, the stand was not too crowded for very long. 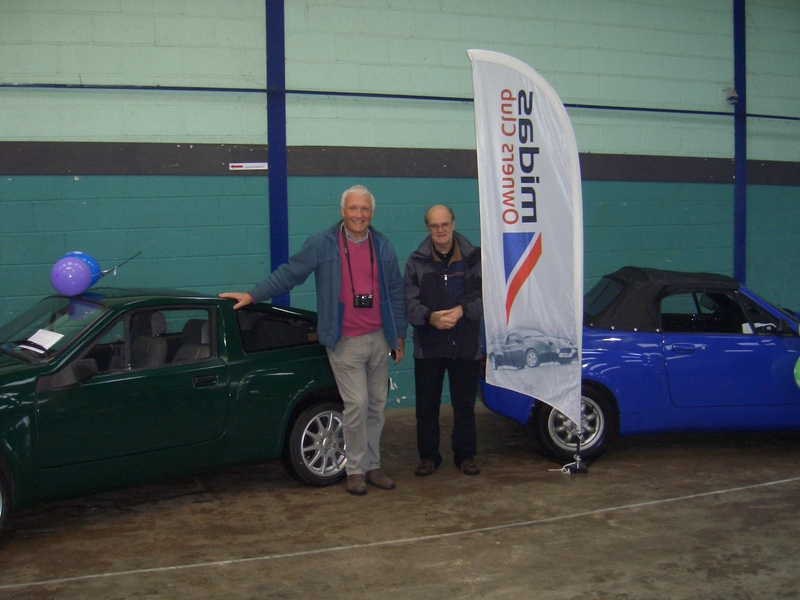 November 2016 – With the Exeter Kit Car Show now just a distant memory, the club again attended the Bristol Classic Vehicle Restoration Show at The Royal Bath and West Showground, Shepton Mallet. 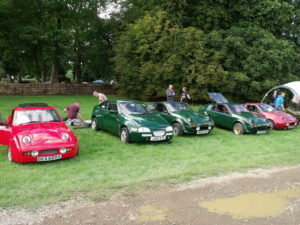 This year, without the Mini Marcos Owners Club joining us, we took a smaller stand and made up for quantity with quality. David Stephens’ newly painted Gold Coupe grabbed a lot of attention, but the Mk2s of Brian Badcock and Meredith Phillips were equally smartly presented and also got a lot of interest. Outside in the classic cars car park we were represented by a pair of Gold Coupes, those of Kelvin Kinkaid and Alistair Courtney who both helped out on the stand. Once again this proved to be an excellent show to end the season. What it lacks in warm weather it makes up for in friendliness and we look forward to attending again next year. So that was it for 2016, but 2017 is now upon us and the calendar page will soon be filling up with events for this year so remember to keep an eye on it for news of the club’s activities. A new event for the club and another important step into the classic car arena. 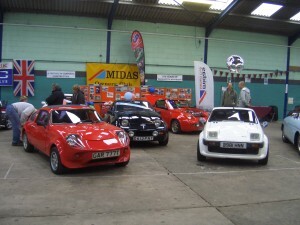 We shared a stand with our friends, the Mini Marcos Owners Club and greeted many interested visitors over the weekend. 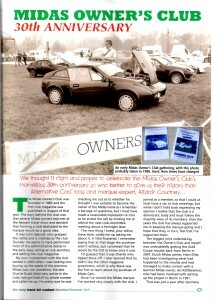 Two years ago the club decided that it should put its efforts into promoting the Midas marque in the classic car scene. With the oldest cars approaching their 40th birthday (yes we will have to get a Midas Mk1 birthday cake made for that anniversary!) and the last Harold Dermott built cars already over 27 years of age, the Midas sits more naturally alongside other classic sports cars than it does among today’s kit cars. 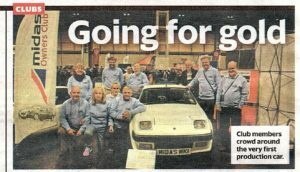 Last year we celebrated the club’s 30th anniversary and included a stand at the Classic Vehicle Restoration Show held at the Royal Bath and West Showground, near Shepton mallet, in November. Thanks to the success of our stand there, the organisers invited us to attend their much larger summer show, the Bristol Classic Car show. With a stand located by a busy thoroughfare, we drew a lot of attention. 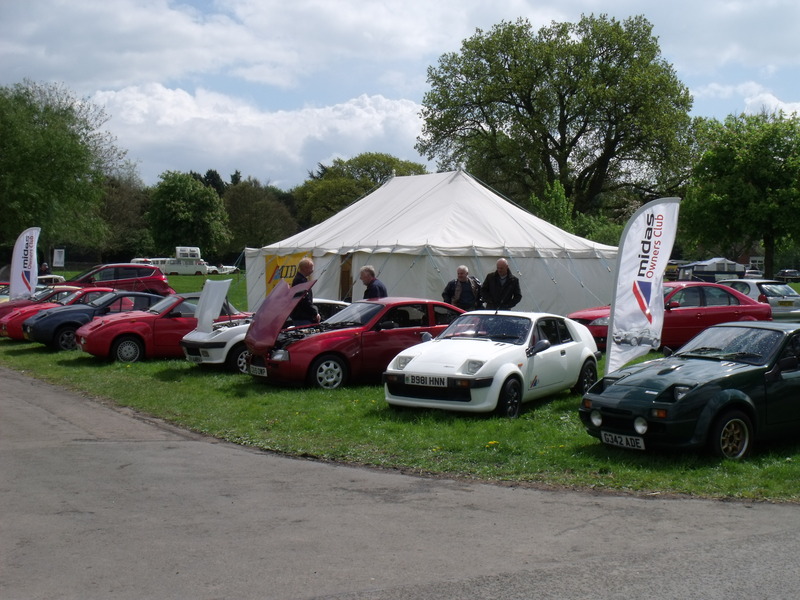 We had three coupes on show, a Mk2 Bronze, a Mk3 Gold and a Mk4 Cortez. The Mini Marcos Owners club took advantage of the opportunity to swap cars overnight, so on Saturday they had two Mini Marcoses, but on Sunday they had a Mini Jem and a Mini Marcos. We were only missing a Midas Mk1 coupe to complete the lineage. After the success of the club’s 30th anniversary celebration in 2015, we wondered whether 2016 might be a bit of a come down. We were down by a couple of cars on Sunday with around 17 cars present, but on Monday we had 16 up by 4 on 2015. We may not have had a Midas birthday cake to share around this year, but we still held our AGM, barbeque and concours. The standard of presentation was even better this year, making the judges job harder than ever and it was great to see that the cars are being used and loved. 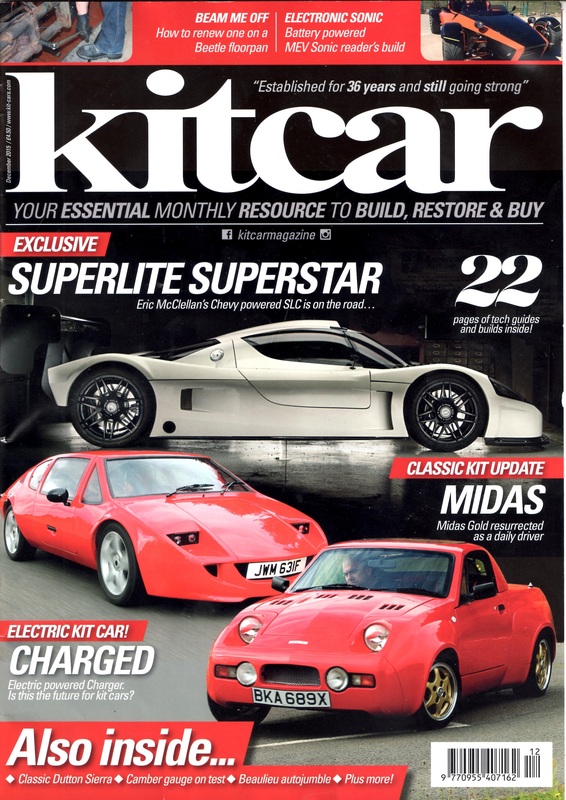 Kit Car magazine has an eight page feature on Richard Streets’ kit car history, telling the story of his Mk2 Bronze, a brief flirtation with a Robin Hood and how he has transformed his Gold convertible into one of the best examples currently on the road. 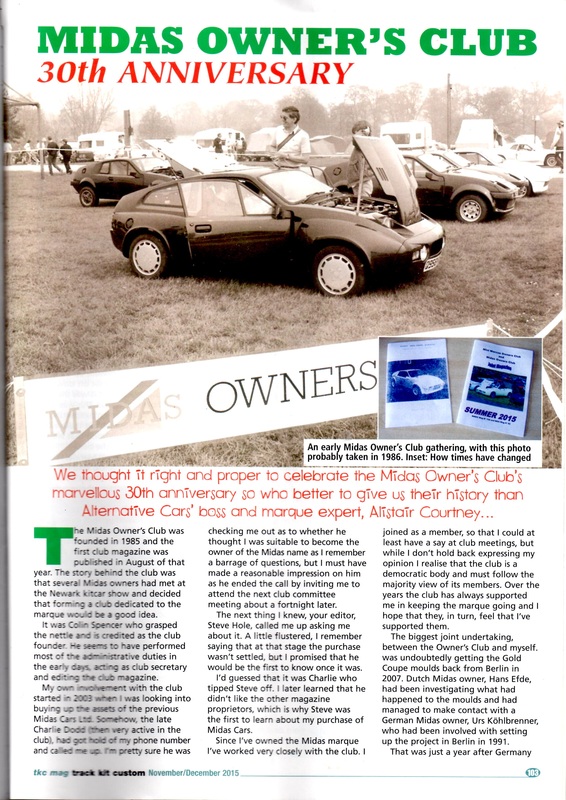 TKC magazine has a feature on the Midas Owners Club, its anniversary and in particular it relates the story of how the Gold Coupe moulds were retrieved from Berlin. 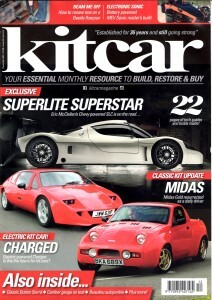 These magazines are currently in the newsagents, so look out for them now! The Footman James Classic Vehicle Restoration Show, 7th & 8th November 2015, Royal Bath & West Showground, Shepton Mallet. 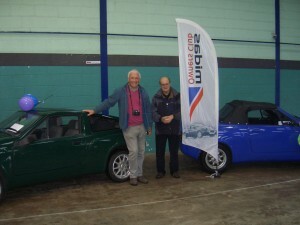 For our first venture for the club into classic car shows we could not have dreamed of a better show. 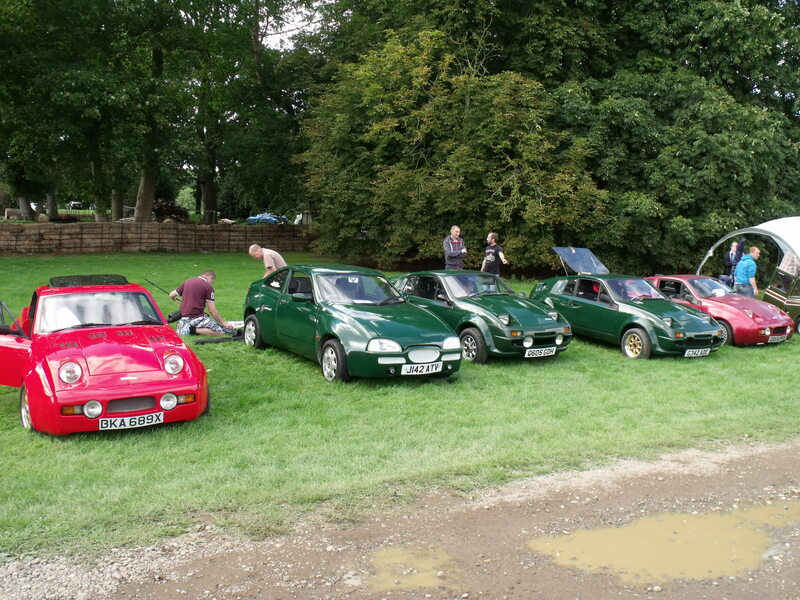 The club members rallied round and we ended up with more cars than we could fit on our stand! Fortunately, the last bit of empty space was just across the aisle so we set up a satellite stand there for a couple more cars. Guests of honour were Roger and Melanie Garland representing the Mini Marcos Owners Club, further cementing the ties between our two clubs. As the Mini-Marcos is celebrating its 50th birthday this year and both the Mk3 Midas Gold Coupe and the Mk4 2+2/Cortez are celebrating their 30th and 20th birthdays respectively, we felt it appropriate to give the stand a party theme. The cars were adorned with balloons and birthday banners, whilst cake was shared out among the club members present. And a slight remix of the cars for Sunday morning. The show consisted of three large halls for the cars and another one for trade stands. A few more trade stands were situated in the corridor between the main halls and a small autojumble was situated outside. To add further variety a classic car auction was held in another hall, whilst classic and kit car owners were parked on the tarmac right next to the halls. 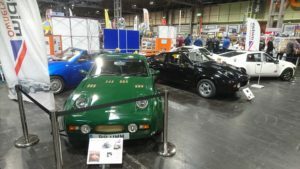 The Kit Car hall was a new idea for the show itself and thanks must go to Ian Stent of Complete Kit Car magazine for arranging it. The show’s organizers were very pleased with the content of the hall and the positive response from the visiting public. 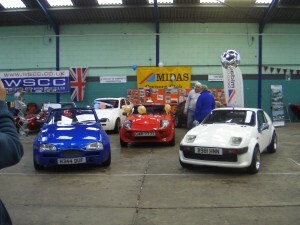 They expect to repeat the exercise next year and the Midas Owners Club hopes to be able to attend again. Once again we were blessed with good weather and the sun shone down on Castle Combe for the last outdoor event of 2015. As usual our members took full advantage of the activities. Some ventured out on track for the fast lapping sessions, whilst others preferred the more restrained lunchtime parade laps. 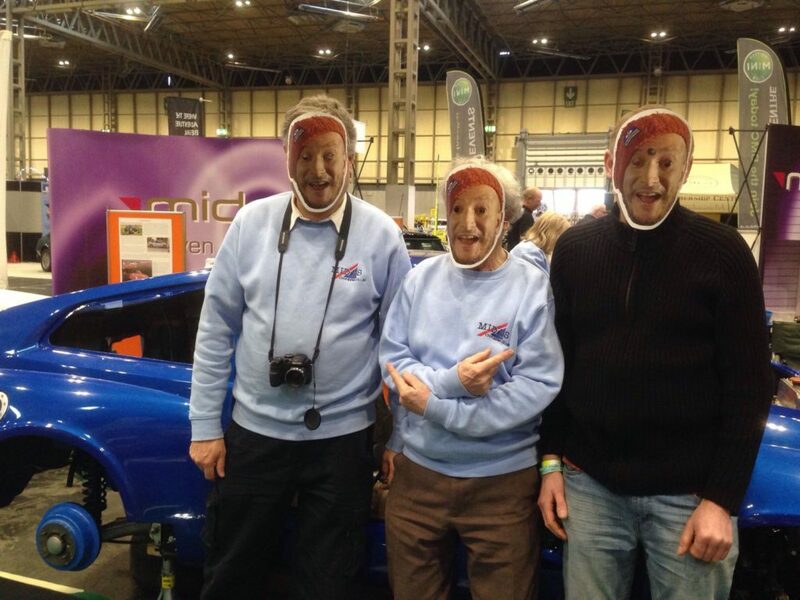 Some just came along to soak up the atmosphere, chat with fellow enthusiasts and peruse the trade stands. Our friends in the Mini-Marcos Owners Club were celebrating the 50th aniversary of the launch of their model and were out in force. They had the honour of leading the parade laps and continued their celebrations with an evening meal and trips to notable Marcos venues the following day. And the official Mini Action Day Facebook page provides an overview of the whole day. This proved to be a really great show and the Mini fans couldn’t have been more welcoming. Nowadays Stanford Hall is open to the public and hosts many events such as the National Mini Day. We didn’t get time to investigate the old manor house as there was too much else to see and do. 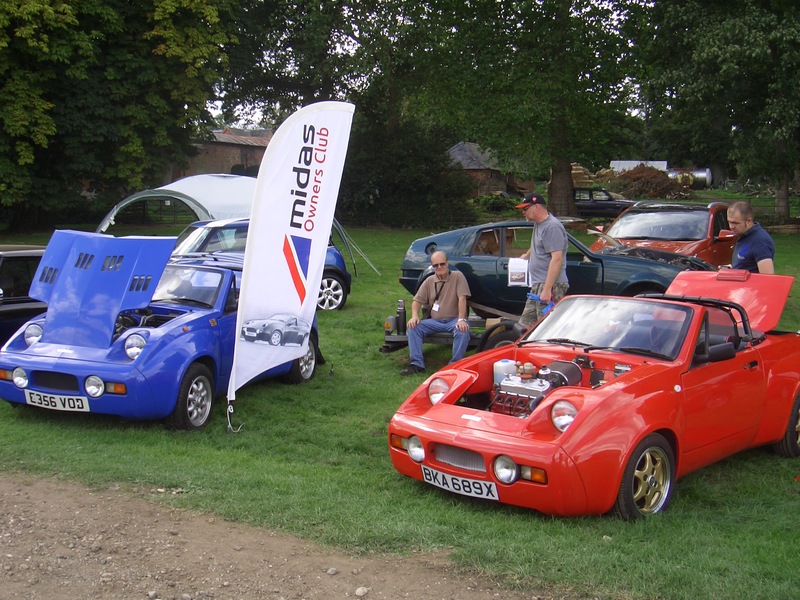 Hopefully, the club will attend the show again next year and more Midas owners will bring their cars along to show the Mini fans what it is all about. Another event blessed with glorious weather! 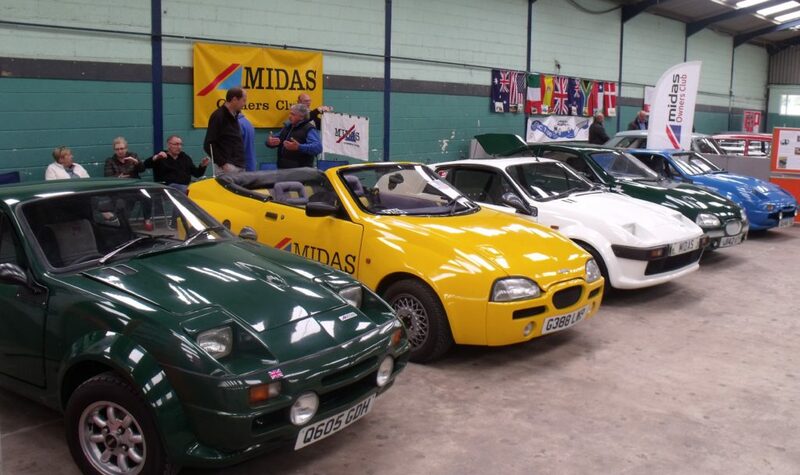 Our group of Midas cars was rather split up by various interlopers (although some comparisons could be made), but that didn’t stop the Midas owners who attended from thoroughly enjoying the day. There was a splendid mix of cars outdoors in the sunshine and a museum full of interesting cars to view indoors.